Since the early 1920s, numerous pamphlets and articles, even a few books, have sought to forge a link between "international bankers" and "Bolshevik revolutionaries." Rarely have these attempts been supported by hard evidence, and never have such attempts been argued within the framework of a scientific methodology. Indeed, some of the "evidence " used in these efforts has been fraudulent, some has been irrelevant, much cannot be checked. Examination of the topic by academic writers has been studiously avoided; probably because the hypothesis offends the neat dichotomy of capitalists versus Communists (and everyone knows, of course, that these are bitter enemies). Moreover, because a great deal that has been written borders on the absurd, a sound academic reputation could easily be wrecked on the shoals of ridicule. Reason enough to avoid the topic. 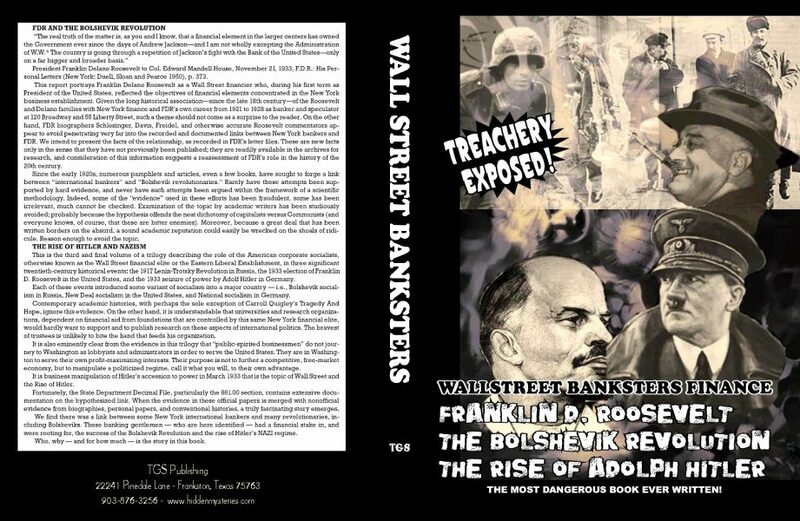 We find there was a link between some New York international bankers and many revolutionaries, including Bolsheviks. These banking gentlemen -- who are here identified -- had a financial stake in, and were rooting for, the success of the Bolshevik Revolution. Who, why -- and for how much -- is the story in this book. You will have a revolution, a terrible revolution. 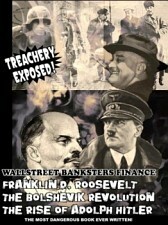 What course it takes will depend much on what Mr. Rockefeller tells Mr. Hague to do. Mr. Rockefeller is a symbol of the American ruling class and Mr. Hague is a symbol of its political tools. In 1916, the year preceding the Russian Revolution, internationalist Leon Trotsky was expelled from France, officially because of his participation in the Zimmerwald conference but also no doubt because of inflammatory articles written for Nashe Slovo, a Russian- language newspaper printed in Paris. In September 1916 Trotsky was politely escorted across the Spanish border by French police. A few days later Madrid police arrested the internationalist and lodged him in a "first-class cell" at a charge of one-andone- haft pesetas per day. Subsequently Trotsky was taken to Cadiz, then to Barcelona finally to be placed on board the Spanish Transatlantic Company steamer Monserrat. Trotsky and family crossed the Atlantic Ocean and landed in New York on January 13, 1917. Other Trotskyites also made their way westward across the Atlantic. Indeed, one Trotskyite group acquired sufficient immediate influence in Mexico to write the Constitution of Quer.taro for the revolutionary 1917 Carranza government, giving Mexico the dubious distinction of being the first government in the world to adopt a Soviet-type constitution. How did Trotsky, who knew only German and Russian, survive in capitalist America? According to his autobiography, My Life, "My only profession in New York was that of a revolutionary socialist." In other words, Trotsky wrote occasional articles for Novy Mir, the New York Russian socialist journal. Yet we know that the Trotsky family apartment in New York had a refrigerator and a telephone, and, according to Trotsky, that the family occasionally traveled in a chauffeured limousine. This mode of living puzzled the two young Trotsky boys. When they went into a tearoom, the boys would anxiously demand of their mother, "Why doesn't the chauffeur come in?" The stylish living standard is also at odds with Trotsky's reported income. The only funds that Trotsky admits receiving in 1916 and 1917 are $310, and, said Trotsky, "I distributed the $310 among five emigrants who were returning to Russia." Yet Trotsky had paid for a first-class cell in Spain, the Trotsky family had traveled across Europe to the United States, they had acquired an excellent apartment in New York -- paying rent three months in advance -- and they had use of a chauffeured limousine. All this on the earnings of an impoverished revolutionary for a few articles for the low-circulation Russian-language newspaper Nashe Slovo in Paris and Novy Mir in New York! Joseph Nedava estimates Trotsky's 1917 income at $12.00 per week, "supplemented by some lecture fees." Trotsky was in New York in 1917 for three months, from January to March, so that makes $144.00 in income from Novy Mir and, say, another $100.00 in lecture fees, for a total of $244.00. Of this $244.00 Trotsky was able to give away $310.00 to his friends, pay for the New York apartment, provide for his familyÊ-- and find the $10,000 that was taken from him in April 1917 by Canadian authorities in Halifax. Trotsky claims that those who said he had other sources of income are "slanderers" spreading "stupid calumnies" and "lies," but unless Trotsky was playing the horses at the Jamaica racetrack, it can't be done. Obviously Trotsky had an unreported source of income. What was that source? In The Road to Safety, author Arthur Willert says Trotsky earned a living by working as an electrician for Fox Film Studios. Other writers have cited other occupations, but there is no evidence that Trotsky occupied himself for remuneration otherwise than by writing and speaking.